Cambridge University Press, 9780521228039, 974pp. 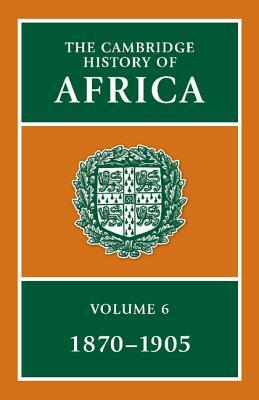 Volume VI of The Cambridge History of Africa covers the period 1870-1905, when the European powers (Britain, France, Germany, Portugal and Italy) divided the continent into colonial territories and vied with each other for control over vast tracts of land and valuable mineral resources. At the same time, it was a period during which much of Africa still had a history of its own. Colonial governments were very weak and could exist only by playing a large part both in opening up the continent to outside influences and in building larger political unities. The volume begins with a survey of the whole of Africa on the eve of the paper partition, and continues with nine regional surveys of events as they occured on the ground. Only in northern and southern Africa did these develop into classical colonial forms, with basis of outright conquest. Elsewhere, compromises emerged and most Africans were able to pursue the politics of survival. Partition was a process, not an event. The process was essentially one of modernisation in the face of outside challenge.